Amazon.com description: Product Description: Demand letters, often overlooked, are a key part of the legal process. An attorney with a commercial practice is regularly faced with a client who has a problem that requires assistance with a demand letter. This client can be claiming payment of money on a contract, demanding the return of property, requests performance of an economic or noneconomic covenant, or asserts damages from a tort or other wrongful conduct. Providing a roadmap to the various letters a creditor client may require, David J. Cook supplies an engagingly written survey of these demand and collections letters, along with a library of useful forms.Opening with background on the various purposes that involve demand or collections letters and the basic terms involved, the author consider the various means of delivery to the intended recipient, the expected (and often unexpected) outcomes and risks, and tips for writing them. 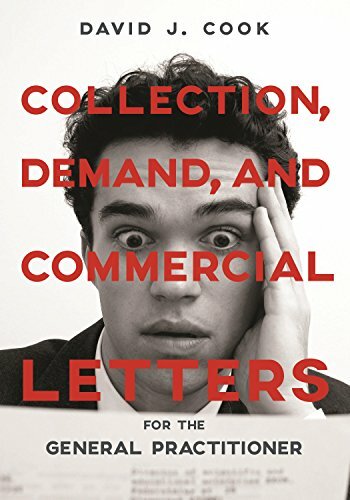 Making Collection, Demand, and Commercial Letters for the General Practitioner an exceptionally useful practice guide, the author then provides dozens of sample letters Ã¢ÂÂ letters he himself has used Ã¢ÂÂ and follows each example with a pointed commentary. More than seventy complete letters included in the book cover situations that call for demands for payment, due on demand notices, claims and conflicting claims, agreements, breach of offer, notices, and many more. Every sample form is followed by expert commentary that explains the letter, the situation it is used for, and other legal concerns. About: Demand letters, often overlooked, are a key part of the legal process.